What would a trip to Japan be without a visit to Tokyo? Probably good enough, but it wouldn't be as spectacular and wonderfully unique. During our five days in Tokyo my husband and I experienced a whole variety of new and different things. Given that we only had five days, we chose to focus on things most appealing to us, knowing that the city could cater to any interest there is. So, let me introduce Tokyo seen through our eyes, one neighborhood at the time. Just waking around in the Shinjuku district is fascinating, as most guide books will tell you. But three things in particular stood out to us. Firstly, the Shinjuku metro station is massive. The station average over 3.5 million commuters every day. We found ourselves there in rush hour and it was truly an exceptional experience. I probably would have enjoyed it more, if I planned to be there to watch the spectacle rather than trying to navigate through the masses with a specific destination in mind. Secondly, just by the Shinjuku station you'll find Takashimaya Times Square. In the building you'll find Tokyu Hands, which turned out to be my favorite store in Japan. Image, eight floors of things you can't live without and things you never knew you needed (or wanted). Crazy kitchen utensils, appliances, make-up, pet supplies, stickers, bikes etc. all in the same store. There are a couple of Tokyu Hands in the city, but this seems to be the easiest one to shop at. Thirdly and most importantly, The Capcom Café. For those of you who don't know Capcom, it's the gaming company behind games like Street Fighter, Tekken, Resident Evil, Phoenix Wright and many others. If you already know Capcom, you should be pretty excited by now. The Capcom café is located in Shinjuku's "red-light district" Kabukicho. You get a two hour time slot during which you can eat, drink, game and participate in several skits conducted by the waitstaff of the café. All the items on the menu are inspired and named after a video game character. We shared a Ryu and a Kazuya drink, ate some Phoenix Wright pasta and a Dhalsim curry baked potato. If you're a gaming enthusiasts like us, this is the place to be. Harajuku is probably my favorite district in Tokyo. To me, it had the perfect combination of international high-fashion, urban design, crazy Japanese street fashion and picturesque alleyways full of flowers and small coffeeshops. The best way to experience the pretty and urban vibe of Harajuku is to walk down Cat Street and it's surrounding alleyways. While in this area you might want to make a stop at Ra.a.g.f (Rabbit And Grow Fat). It's one of Tokyo's rabbit cafés. For 300 yen you get one beverage and 30 minutes to hang out with bunnies. We were lucky enough to have our coffee accompanied by a litter of one month old bunnies. ADORABLE!! Or as the Japanese would say "KAWAII". Another patron at the rabbit café had a slightly hysterical breakdown when she saw the bunnies. A literal cute-overload. When visiting Harajuku there is another must. You must take a stroll on Takeshita-dori. It's the perfect place to get a glimpse of Japanese street fashion. One can't be anything but fascinated and impressed by the carefully orchestrated looks that are put together in meticulous ways. After a walk down Takeshita-dori, the unusual seemed mundane, the unique had turned average and the spectacular was nothing more than the expected. We didn't spend too much time exploring the Shibuya district. It looked like a fascinating area and I'm sure it has a lot to offer, but we simply ran out of time. The only thing we took a closer look at was the famous Shibuya crossing. One of the most recognized images of Tokyo is of an insanely busy pedestrian intersection. That would Shibuya crossing. An estimated 100 000 people pass through the intersection, every hour! After have been there, that estimate doesn't feel a least bit exaggerated. Roppongi was another area we didn't have enough time to explore. However, I do have one recommendation, the Mori Tower observation deck. Walking around the popular shopping district, sampling foods at the big department stores, visiting the Sony Building and buying cloths at Uniqlo would have been fun enough, but Ginza had much more to offer. You might have heard of the Tsukiji Fish Market and its famous tuna auction. It is always mentioned on Tokyo must visit lists. After have been there, I will have to agree. It was well worth getting up at 3.30 am, getting there by 4.15 am and standing in line until 5.25 am, when we were allowed into the auction. Then eating the freshest sushi imaginable at 6.30 am was the perfect way to round up a morning at the fish market. I would highly recommend you to stick around or return to the fish market, to experience the Intermediate Wholesale area, which opens at 9 am. Bring your camera! Any guidebook will tell you that Akihabara is the electronics district of Tokyo. But before you jump to to the conclusions that Akihabara just caters to fans of Best Buy and Fry's Electronics, you should know that while Akihabara might have started off in electronics, it has evolved way beyond its simple beginnings. Akihabara is the perfect place to explore the more "indulgent" side of Japanese culture. The streets are filled with video gaming halls, toy stores, UFO catcher machines, maid cafés, pachinko parlors, capsule vending machines and, of course, electronic shops. I realize that the list of things I just mentioned might need further explanation. If you're unfamiliar with any of terms, I recommend you to Google it, it's fascinating stuff. Make sure to visit Akihabara after the sun sets, when the neon lights are a spectacle in itself. Tokyo has seemingly endless amount of things to offer. Even with the limited amount to time we had, we decided to spend one day in the Tokyo vicinity, rather than in Tokyo city. This was by no means a random decision, we had a very specific goal in mind, The Ghibli Museum in Mitaka. 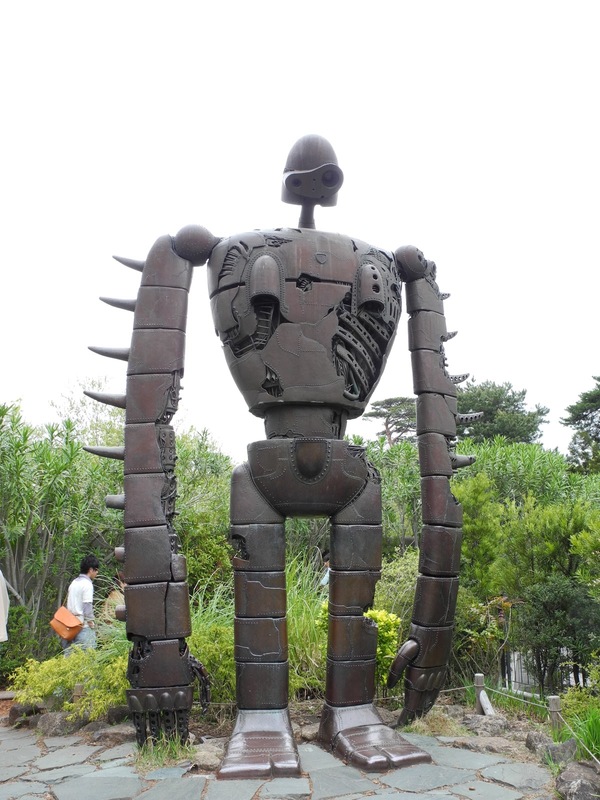 The Ghibli Museum is the home of Studio Ghibli and Hayao Miyazaki's wonderful anime creations. Master creator Hayao Miyazaki is often referred to as Japan's Walt Disney, which is an inaccurate description. I'm a big fan of Disney and love much of what they do, but to me, Disney is entertainment, Studio Ghibli is art and fantasy. If you're not familiar with Hayao Miyazaki's work, such as Spirited Away and My Neighbor Totoro, I highly recommend you to get on it. But either way, if you want to revisit the feeling of childhood wonders, The Ghibli Museum offers that in abundance. On our way back from The Ghibli Museum, we took the opportunity to visit the Broadway Nakano Mall in Nakano. What an experience it was. The mall sold anything and everything. In one store they sold really expensive Rolex watches, next to it was a dollar store and next to that was a restaurant. With no general idea or sense of departments, exploring the mall felt like an endless line fo surprises. Broadway Nakano has another branch in Akihabara which is smaller but more conveniently located. I'm sure you've already figured out how much I enjoyed Tokyo. We had five days to spend and we still ran out of time. But if I had to narrow it down to one single day in Tokyo, doing three things I would start the day at the Tsukiji Fish Market and then walk around in Harajuku, making sure I didn't miss Takeshita-dori. As the night falls, I would spend the reminder of the day in Akihabara, indulging in whatever tickles your fancy.